You should have seen the first draft of this post. You probably would have clicked the back-arrow pretty quickly. And a buck gets ten you'd never have returned to my blog again because of the scattered, drab, downright stanky taste left in your mouth from your visit. Seriously, you would have been looking at a big ol' hot mess. But here's the thing: I knew it was scattered. I knew it was drab. I knew it was a stanky hot mess. And I was good with that. Why? Because I knew the revisions would be coming. I knew I would make my crappy first draft better. A lot better. All the way to the level you are reading now. Because that's just how I write. I write something. And then I revise it...hard. And continue to do so until it's right. And a buck gets ten that's how most writers write. Improving something that's there is just easier than trying to get it all right the first time. But this isn't the norm with students. For students, making a revision is seen as "fixing" something. And if something needs fixing, it had to be wrong in the first place. And students don't like to be wrong. I can't blame them. In much of the other work students do (e.g. math homework, spelling tests, any tests), being correct the first time is the desired outcome. And this mentality spills over into their writing. The revising stage of the writing process often gets whittled down to what amounts to glorified editing: a little tweak here, a little correction there, an extra adjective over there. Revising is more than that. At it's core, revising is all about making decisions, with each choice intended to make something better. If you revise your living room hard, you aren't simply fluffing the pillows or vacuuming dog hair. You are painting walls, rearranging furniture, ripping up floors. Revising your writing hard involves big changes and small changes, adding and eliminating, rearranging and experimenting. When the revising stage gets passed over, or is done superficially, massive opportunities to improve the piece of writing go missed. But more importantly, opportunities to improve as a writer also go missed. I used to think the easiest way to become a better writer was to write a lot. But just as important to improving as a writer is revising your own writing. 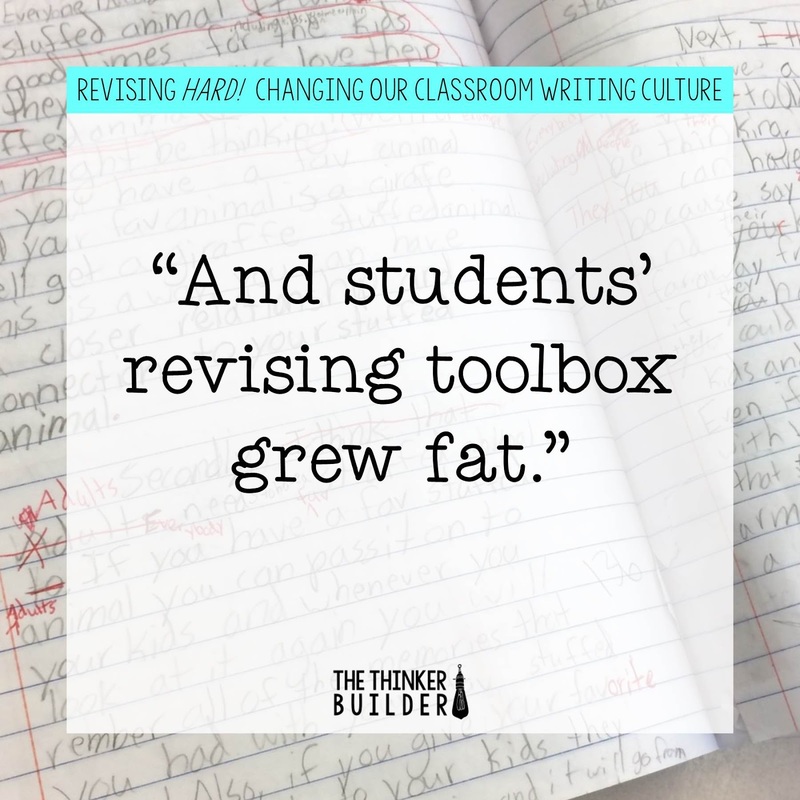 It's here in the trenches of looking critically at our writing, of making decisions about what's working and experimenting with alternatives... it's here where we learn and grow. A ton. And as revising becomes a more natural part of how students write, you're going to see another benefit creep up. When students know (like, really believe in their hearts) that their writing gets better when they spend time revising it, the initial drafting phase actually becomes a lot less stressful. Students don't need to have everything figured out prior to getting started. Stuck on a part? Give it a shot and revise it later. 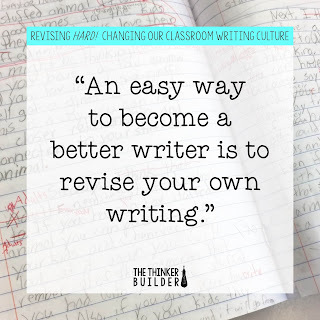 So how do you get a revising-filled writing culture in your classroom? It starts with you. If students never see you revise, don't expect to see them do much either. Maybe you already incorporate modeled writing, where you introduce a new writing skill or strategy by modeling it in front of the class. Whether you realize it or not though, you aren't just modeling the new skill. 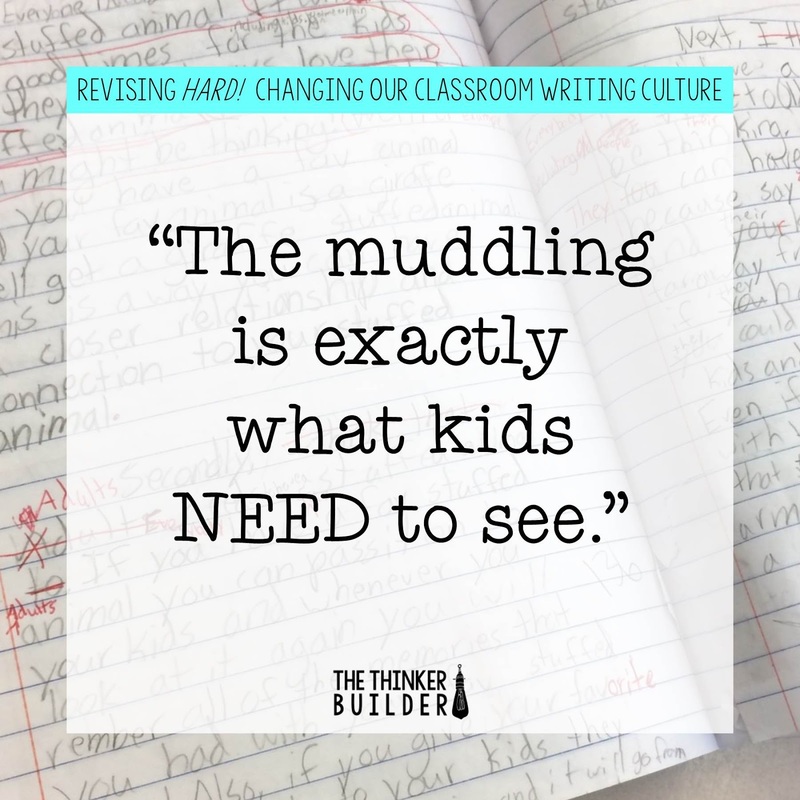 You are modeling all of the surrounding writing behaviors, too. It used to be that when I intended to do some teaching through modeled writing, I would plan the writing piece ahead of time, often writing the entire thing on a sticky note so when I went to write it on chart paper during the lesson, I could do it perfectly without a second thought. But such silky smooth modeled writing is costly. Even though it allowed me to focus my attention on teaching a new writing strategy or skill, my surrounding writing behaviors said, "Hey kids, watch me suddenly pump out this perfectly organized, polished paragraph without even breaking a sweat. This is how writers write. Don't you want to be able to do this?" Yikes! Unintended and indirect though it may have been, that was the way students always saw me write. So I changed. I stopped prepping the writing I would do in front of the class. (Don't get me wrong, I still had a plan for the lesson, but I didn't plan every little detail of the written model.) I stopped trying to write a final draft right off the bat. I intentionally revised portions of what I modeled, thinking aloud so students heard the process. Writing this way in front of students took some getting used to for me. The getting stuck, the messing up, the crossing out, the struggle, the muddling through. But it was ten times more realistic. 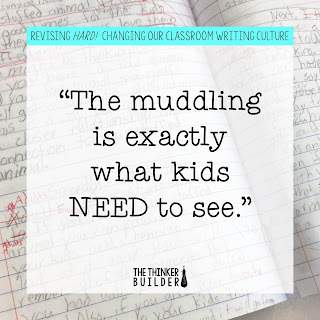 And I'm telling you, the muddling is exactly what kids NEED to see. They need to see it in order to break down the stereotype that a "good writer" writes exactly what they want right away. They need to see the unsettled feeling that it's not quite right yet, the hem and haw over a single word, the move-on-and-come-back. These behaviors do not show weakness. It's an authentic path to making the writing strong. While I do want to end up with a strong model of the new skill I want students to practice, I also want to model how to get there. It takes a little more time during the lesson, sure. But I also saved time by not planning out every little word and phrase ahead of time. And the more students saw me revise the writing I did in front of them, the more natural revising became. Help change the classroom writing culture by removing obstacles that get in the way of revising hard. One obstacle that always pops up is simply where to revise. Often, students fill their paper with drafting, which makes it cumbersome to make significant revisions. Little tricks can help, like skipping lines or drawing arrows, but I've got a solution that sets up the rough draft in a way that's super conducive to revising hard. You can read about it right HERE, a post I wrote for the Upper Elementary Snapshots collaborative blog. 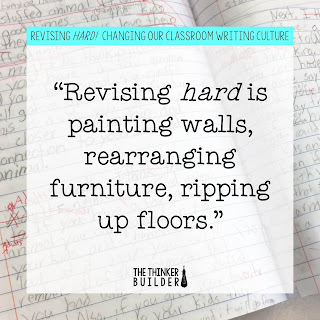 Time can be an obstacle, especially if we're trying to add a bunch more revising into an already cramped writing block. Remove this obstacle by shortening the length of the piece of writing. Instead of having students write, say, five pages, scale down to one to two pages. This gives students more time (and less to deal with) when revising. A third obstacle, which can often be the largest, is student motivation. 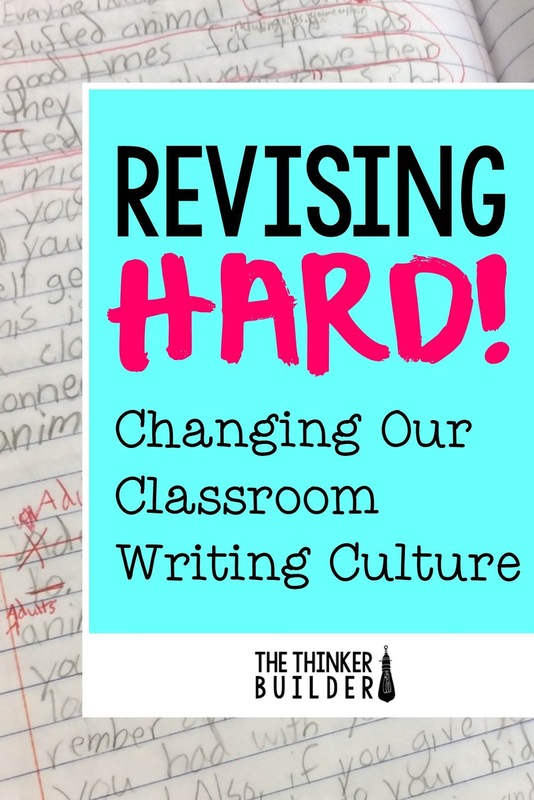 Revising hard is a different way of looking at your writing, one that accepts the idea that your first attempt is not your best. We know this idea doesn't come naturally to most students. 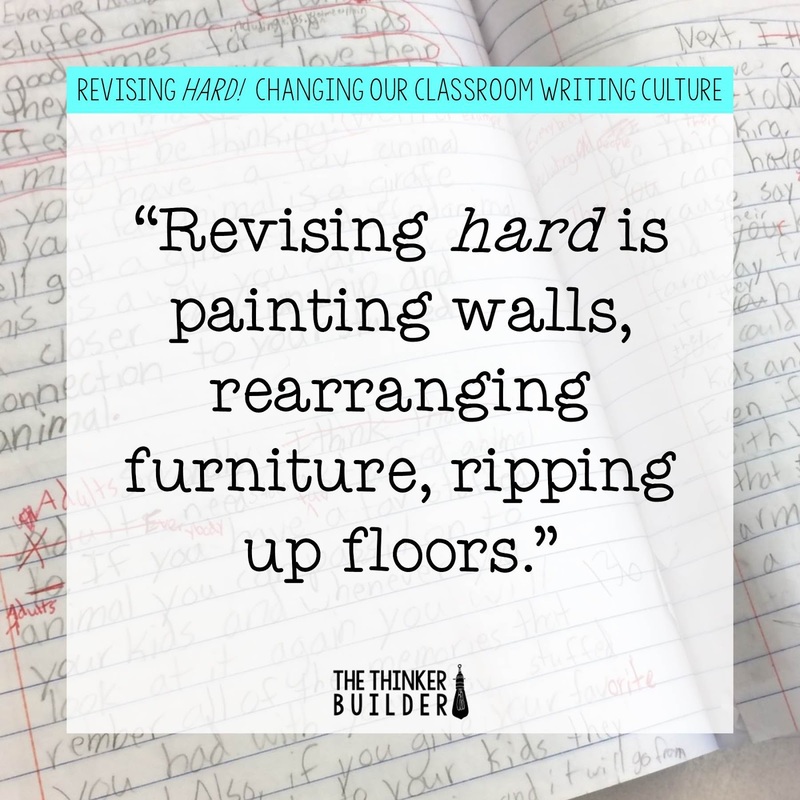 Add to this the fact that many students will see the idea of more revising as simply more work, and motivating students to revise hard can be a challenge. But once the tide turns, it's like a snowball effect. Shorter pieces of writing naturally help the motivation factor for some students. However, I've found two other keys to be even more instrumental: a meaningful topic and past success. 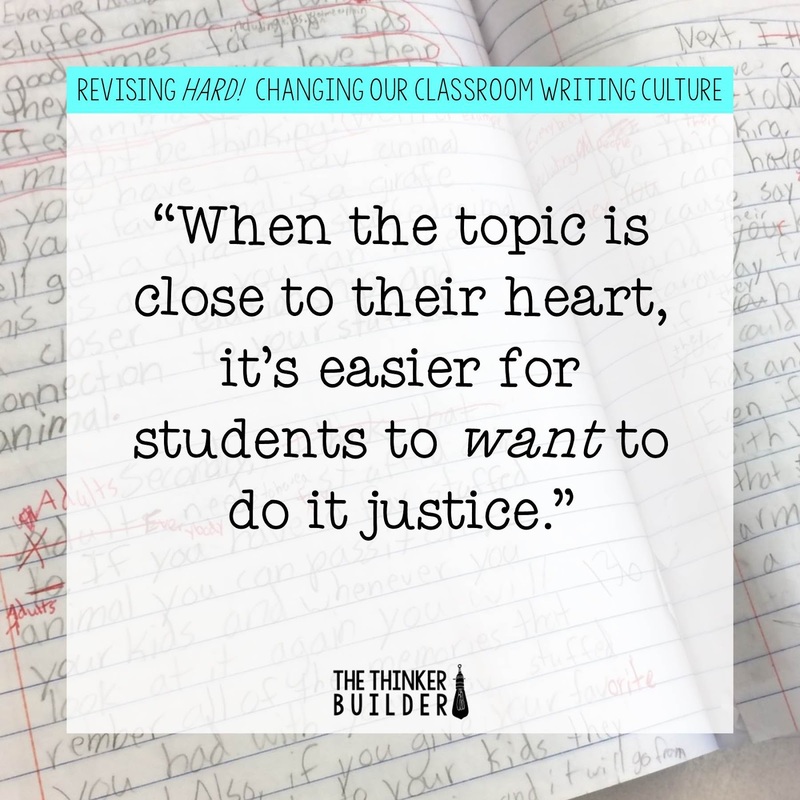 Students have to be writing about an idea that is meaningful to them in order to care enough to revise it hard. When the topic or story is close to their heart, it's easier for students to want to do it justice. Your attempts at moving to a culture of big-time revising will be short-lived if students do not see the fruits of their labor. Make it a priority to highlight the difference in quality, like the before/after photos on an HGTV room makeover. Students need to see how much a piece of writing has improved as a direct result of revising it hard. They need anchor examples of personal success which can then serve as motivation for future writing. 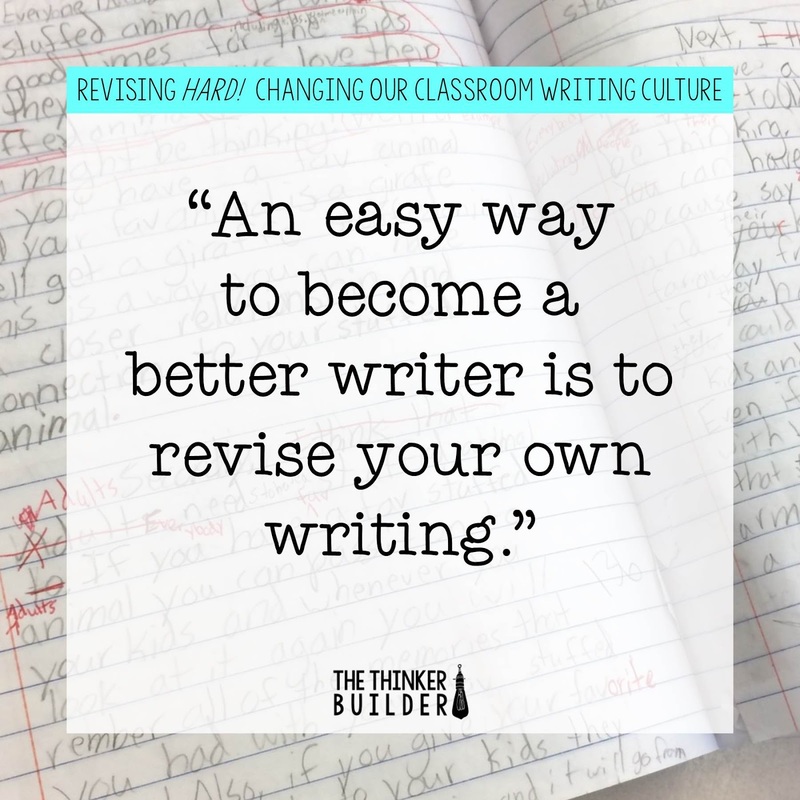 Back in the day, I often found myself asking students to revise their work, assuming they would know what to do, and then I'd get frustrated when I saw their piddly little attempts at making their writing better. But my efforts to explain what it meant to revise were general, even vague. How did I expect students to do something they've never really done before unless I taught them how. 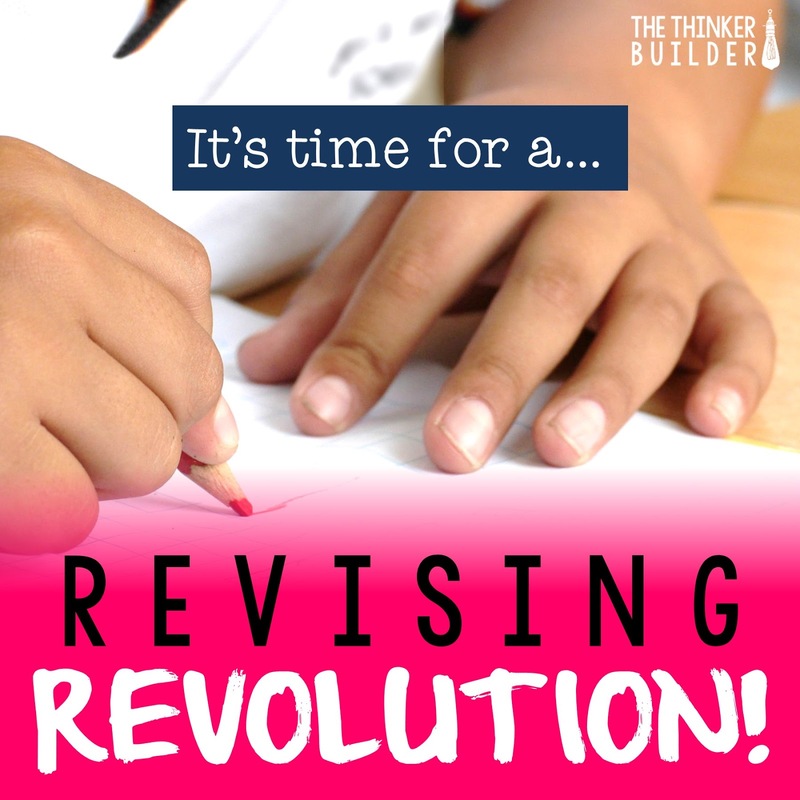 So I began to develop very specific, practical revising strategies, some that could stand alone as a revising lesson and activity, and many that could be applied to whatever it is students were writing. 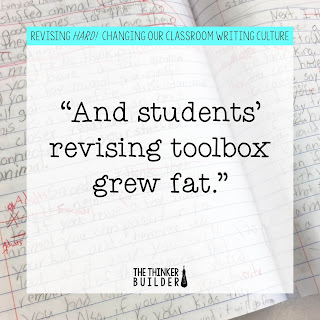 And students' revising "toolbox" grew fat. I share a bunch of these revising strategies with you in my next blog post HERE, but before you go read it, step back and think about your own writing and the revising you do, whether it be an email to an administrator, a post to your classroom blog, or the welcome letter for Meet-the-Teacher Night. What little nuggets of revising gold can you extract and share with your students? 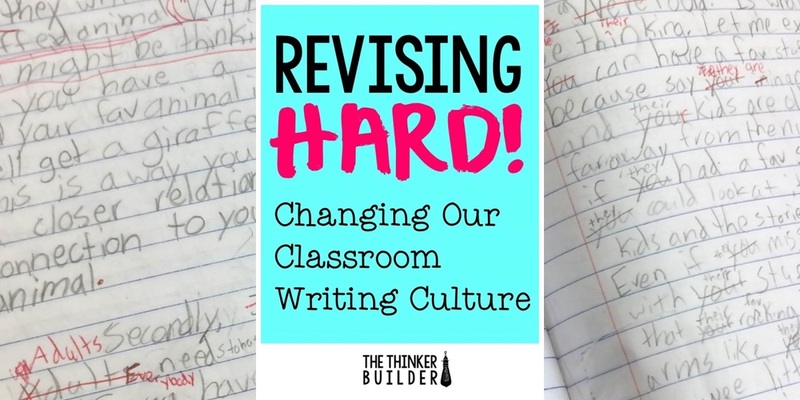 Let's saturate our writing block with undertones of improving what we write, because developing a culture of revising breeds stronger, more thoughtful writers. Sign up and get an exclusive free pack of my reading response pages, carefully created by... (you guessed it) me!